I posted this to my Instastories the other night, but after a particularly frantic week that included a full-day work conference, a batch of hand, foot & mouth, juggling and piecemealing childcare and our typical 3-girly household I just needed to announce it: However you are “Momming,” whether it’s out-of-the-home work, working-from-home, staying home, a hybrid, doing it single, motherhood-in-waiting or motherhood-in-mourning, you are doing an incredible job. I felt quite the opposite all week… like I was failing at it all. But you. You are not. You are doing an amazing job. I can reclaim my control, confidence and peace in the kitchen. Few things fulfill me and calm my jagged, frayed spirit like creating meals that will nourish my family. Summer Chipotle Chicken Cobb Salad – salads are one of those things that I always question whether we need recipes for, but I can attest that this one is excellent. I was out of avocado so used goat cheese instead (um, that seems like an equivalent trade, yes? ), swapped strawberries (saving those “stawbeebees” for Annablair) with blueberries (“boobeebees”) and added pepitas. Turkey and Ricotta Meatballs – I needed to up the salt on these bad boys, but they make A TON and have been a great option for a quick reheat at lunch. Whole30 Tuna Cakes with Smoked Paprika Aioli – well, basically, I destroyed all chances of these being whole30 by adding 1/4 c. panko bread crumbs and using all-purpose flour in place of almond flour. That said, these were excellent, and I can’t wait to make them again. I served them with a green salad, and it was a fresh, light, satisfying dinner. 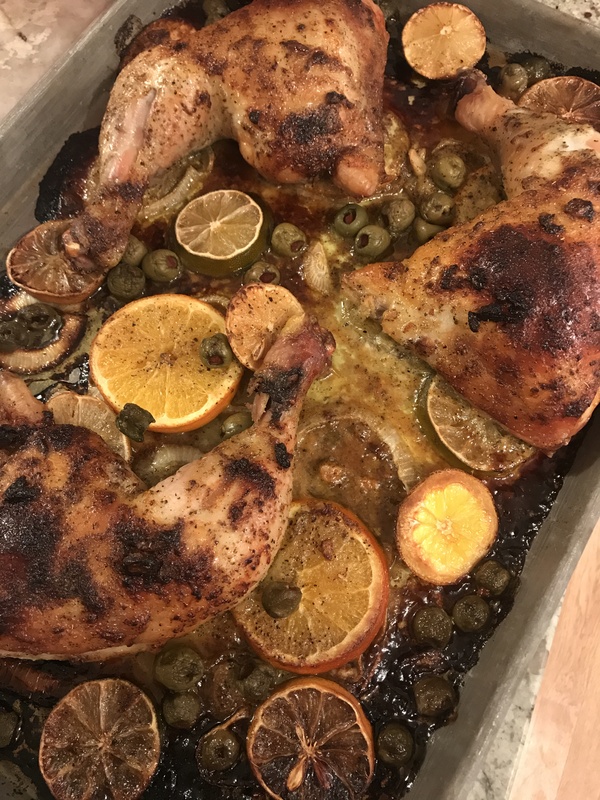 Mojo Sheet Pan Chicken – I made this for the girls the night I made the tuna cakes for our grown up dinner. But, the tuna cakes probably ended up being so satisfying because David and I could not stop picking at the chicken and olives here. Seriously easy and seriously delicious. Mini Salmon Quiches – A solid, healthy and savory option for little girl breakfasts. 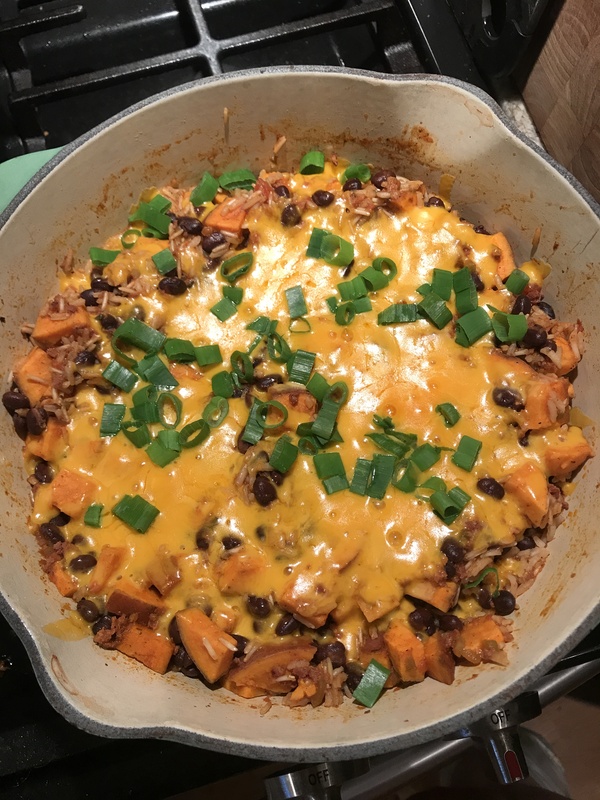 Chorizo Sweet Potato Skillet – This made the best leftovers for the girls and myself all week. I amped it up with avocado and two over-medium eggs plus a drizzle of hot sauce, but it doesn’t need all that. Sometimes you just feel extra, you know? Oven Chicken Risotto – This risotto is a hands-off, make in the casserole dish meal that will be a steady staple around here. I added a 1/4 c. of white wine to add some flavor, but the girls really like it, and I do too. 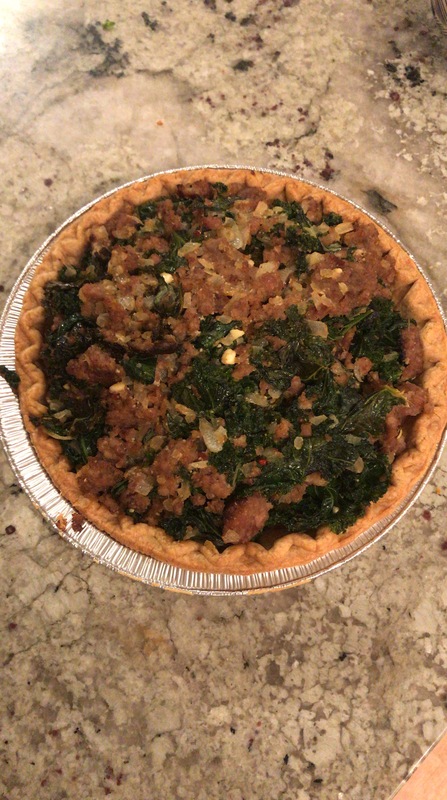 Sausage and Kale Dinner Tart – I ate this for days. It was hefty without weighing me down and was the perfect slice for breakfast, lunch OR dinner. Baked Honey Hot Chicken Sandwiches – seriously loved this chicken and will make again… and soon. The leftover chicken was perfect chopped over a salad for leftovers. Summer Squash Casserole – after reading this recipe on my friend Jen’s site, I made it immediately. As in that night. We had some farmer’s market squash and zucchini languishing in the fridge, and this delicious, easy recipe was just the ticket. Sicilian Rice Ball Casserole – for some reason my girls don’t love eating warm leftovers. Nora Beth, in particular, always requests it cold. I always oblige, and they were decently interested in this casserole as a cold, leftover lunch, BUT they demolished my own bowl of it reheated. Spanish Baked Rice – clearly rice was a common theme in my recipes over the past few weeks, but it’s in an inexpensive, incredibly versatile staple. This came out of the oven tonight, and even though I’d eaten leftover cobb salad, I couldn’t help digging in for a couple of bites. Bacon and Leek Baked Gnocchi – I remember that I really liked this when I made it, but in full transparency, I don’t remember much else about it.